Illuminated opening leaf from the Bamberg Breviary of 14 October 1501 on vellum. Germany, Nuremberg, Schreyer workshop, dated 1502. This leaf was originally the frontispiece to a Breviary. 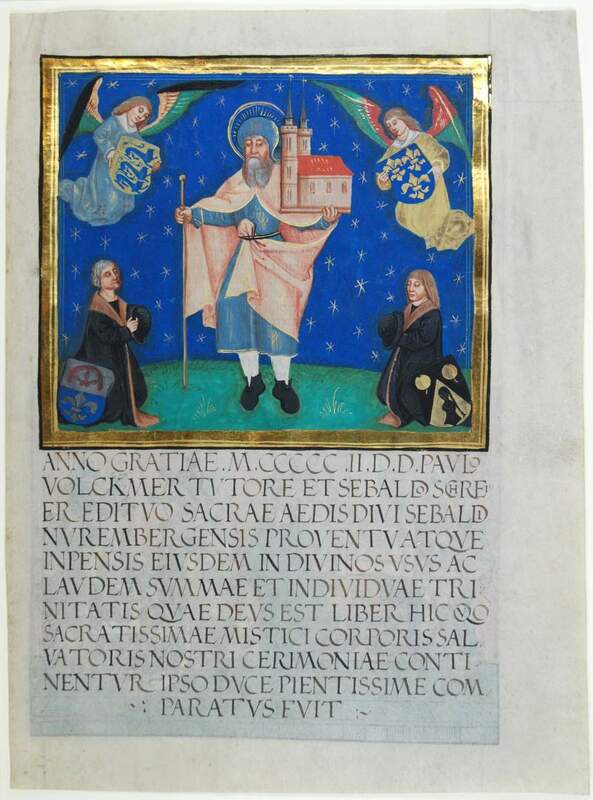 The half-page miniature on recto shows two Nuremberg citizens kneeling in front of St. Sebaldus. On the verso, one can see the printed authorization of Bishop Vitus of Bamberg (“Vitus dei gratia...”), followed by a hand-coloured, half-page size woodcut of Emperor Henry II and his wife Kunegundis, patrons of the diocese of Bamberg, accompanied by the coat of arms of Veit Truchsess von Pommersfelden, prince-bishop of Bamberg (1501-1503). Miniature. Tempera, ink and gold on vellum; on verso: handpainted woodcut. Leaf: 310 x 230 mm; miniature: 159 x 180 mm. Nuremberg's citizens prodigiously fostered the cult of St. Sebald, who is represented here as a pilgrim with a model of his church and flanked by two donors. The patrons are the leading citizens Paul Volckammer (d. 1505) and Sebald Schreyer (d. 1520), respectively tutor and custos (aedilis) of St. Sebaldus Church. Although the books were given in honour of God and the Holy Trinity for use in Holy Office, the images were included to remember the priest to say prayers for the salvation of the souls of the donors – such images, but also epitaphs, triptychs and stained-glass windows were part of the medieval system of memoria. Volckammer and Sebald Schreyer commissioned various works of art for their parish church. Schreyer also took the initiative in several printing projects: in Bamberg, he commissioned two breviaries on vellum, dated 21 February 1484, which he had illuminated and bound in Nuremberg. In 1490, he ordered, again in Bamberg, twenty-one Missals printed on vellum. In six of these, a hand-painted portrait of St. Sebald with both donors was added on the recto of the canon illustration; and this was repeated in 1496. Of these two series, only six donor portraits are known to have survived. In 1501, Schreyer again ordered new Breviaries in Nuremberg to be printed on vellum and again donor images were added. One year later, in 1502, similar hand-painted donor images were added as a frontispiece to the book (on the blank recto of the printed authorization on the verso). Two single donor portraits of 1502 have survived intact. Although similar, none of the illuminated miniatures are the same, but over the years, all were presumably executed in the so-called ‘Schreyer workshop’ in Nuremberg. Sebald Schreyer, who is mostly known for his role in the production of Hartmann Schedel's World Chronicle, comes forward as a fascinating Nuremberg burgher. The donor portraits are part of a more comprehensive and quite interesting memoria culture in which Schreyer was the leading protagonist – also supporting the memoria of family members and friends. Read more about this miniature in our blog post on memoria culture.